COLOMBO, Nov 18, 2018- Ibrahim Mohamed Solih was inaugurated Saturday as the new president of the Maldives after the opposition united to dislodge pro-China strongman leader Abdulla Yameen in September elections. Solih, 54, emerged as common opposition candidate as all key dissidents were either jailed or forced into exile by Yameen who took power following a controversial run-off in 2013. 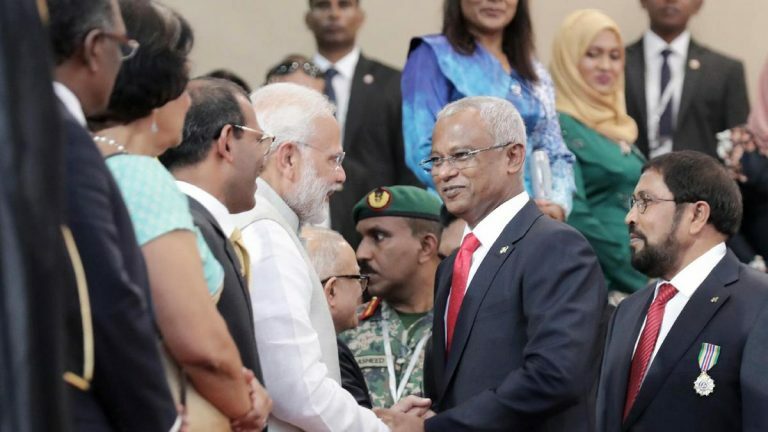 At a special session of parliament held at the National Football Stadium in the capital Male, Solih was sworn in with India’s Prime Minister Narendra Modi among those in attendance. The Maldives foreign ministry said China’s culture minister Luo Shugang was also an invitee. Modi’s presence was a reflection of the relief felt in India, which has long held sway in the archipelago, and in the West that Yameen was voted out. The United States and the European Union had threatened sanctions if the vote had not been free and fair. Both neighbouring India and Western nations watched with concern as Yameen moved closer to Beijing which loaned the strategically placed archipelago millions of dollars for infrastructure. Solih’s Maldivian Democratic Party (MDP) has pledged to end what it called “China’s colonialism” and to resist a “land grab” in the country which straddles key East-West shipping routes. MDP leader and former president Mohamed Nasheed has vowed his party would reduce reliance on China and renegotiate millions of dollars in loans taken from Beijing. More than 80 percent the Maldives foreign debt is owed to China, he said. China has also loaned other countries around the Indian Ocean and beyond large amounts of money for infrastructure projects as part of Beijing’s Belt and Road Initiative, alarming the West. Sri Lanka last year granted a 99-year lease on the Hambantota deep-sea port to Beijing, after it was unable to repay Chinese loans for the $1.4-billion project. Mahinda Rajapakse, Sri Lanka’s prime minister when Colombo took out the loans, is looking to return to power in the severe current political crisis gripping the island nation. During a recent visit to Colombo in the middle of his election campaign, Solih told reporters that he wanted to repair ties with immediate neighbours Sri Lanka and India. Yameen awarded major infrastructure projects to China while taking away a major airport development from India. He also relied on Beijing for diplomatic support as the Maldives faced international isolation over his dismal rights record.